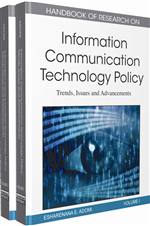 Information communication technologies (ICTs) have continued to evolve at very rapid rate. The advancement in ICTs impacted greatly on the practice of journalism and blurred the distinct values that separate radio, television and newspapers in the old media. It is now possible to accessed radio, television and newspaper from one source in the new media. However, there is no clear-cut law or regulation that addresses this convergence of the old media in the new media in Nigeria. The chapter takes a look at the various media laws in the country and notes their point of convergence or divergence if any. The chapter further explores the nation’s media laws for their places in the country’s ICTs policy or the reverse order where such media laws cover or take care of certain ICTs operations. It found there are gaps in ICTs regulations in the country. It recommends a unification of policies or extant laws to address the new order where the old media have been rolled into one. The study draws on the historical and archival methods. Data gathered through observations and reviews of available relevant literatures were analyzed qualitatively. In order to put this report together, a method to collect data from different sources was worked out. Books, journals, CDs and available websites were randomly searched for form of works on new media, conventional media, and legal regulations. The retrieved literatures were critically examined against the backdrop of emerging issues in ICTs and the communications world. The analyzed data were reported qualitatively. Journalism Practice (For the Old Media): The act of gathering, processing and writing stories for public consumption through newspapers, radio and television. Regulatory Bodies: These are organizations guided by certain policies or laws that comprises of members reposed with the authority to oversee activities in a particular field of journalism practice. Electronic Media: The electronic media have one thing in common. Aural and visual signals are converted into electrical impulses. These are in-turn recovered into aura and visual signals for people to hear and see by means of specific technologies. ICTs: The acronym stands for information communication technologies – that is information technology tools used in communication. The Broadcast Media: The broadcast media is a member of the electronic family. It is made up of radio and television. The practice of journalism takes place in the sphere of the broadcast media - radio and television. Media (For the New Media): It is not institutional. It is ICT based. It is innovations in ICT that actually made it possible for interaction to take place through computer networks, mobile phones and other gadgets to a tribe of audience or the “general public”. Old Media: It is the form of media practice that has been known to the world. New Media: It is a new form of media practice where advancement in ICTs has made it possible for the computer to act as a medium for production, storage and distribution. The Print Media: The print media comprises of printed matter. Books, newspapers and magazines. In this study the concern is on newspaper. Media (For the Old Media): An institutional structure that provides the avenue or facilities through which journalists gather, process and feed news to the world. Journalism Practice (For the New mMedia): It is a forum where innovations in information communications technologies (ICTs) help bring people of diverse groups and interests together with their computer for interaction or to share materials.